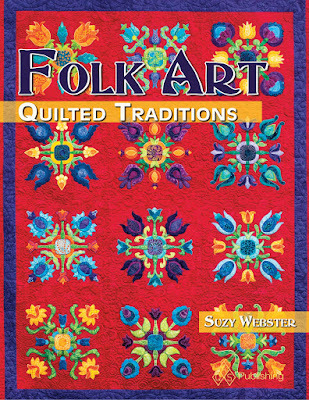 Folk Art Quilted Traditions...a Month from TODAY! So, I'm more than a little bit excited for my first quilting book to come out from the American Quilter's Society exactly a month from TODAY! August 30, 2016! I can't wait to share 5 fun projects (bag, table runner, wall quilt, and 2 bed quilts!) and twelve terrific applique blocks! You can preorder it directly from AQS (20% off for members!) or Amazon or Barnes and Noble. I will have some copies available for purchase directly from me for local family and friends too. 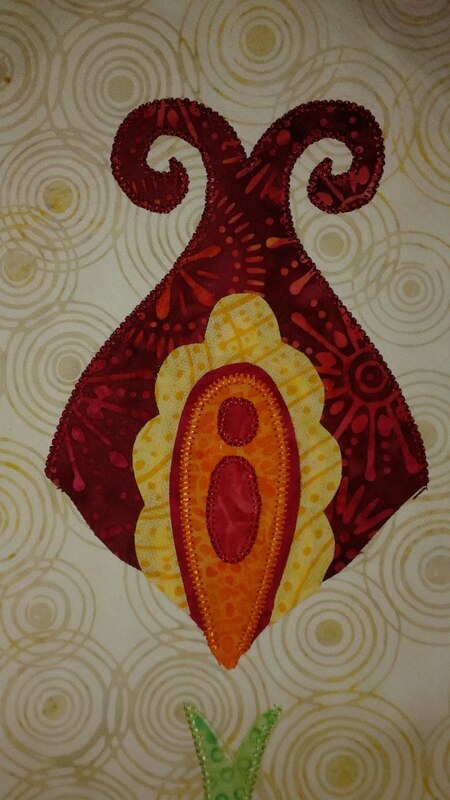 AND here is a sneak peak at the beginning of my new applique project you'll see Wednesday...I LOVE fussy cutting. It's worth it sometimes! 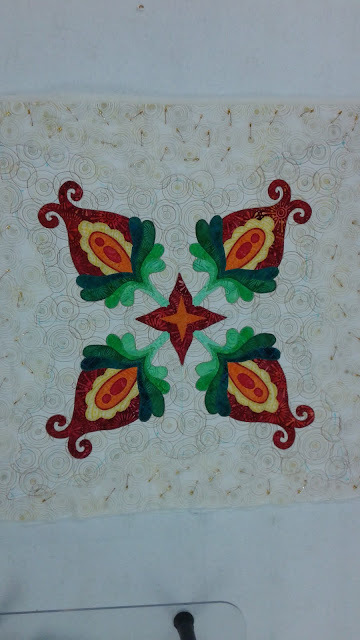 I'm excited to share my second design in my Brick Wall Free Motion Quilt Along made out of my gorgeous Island Batik solids. This pattern is called Lacy Clamshells. I discovered a lot about this design as I was working on stitching it out. 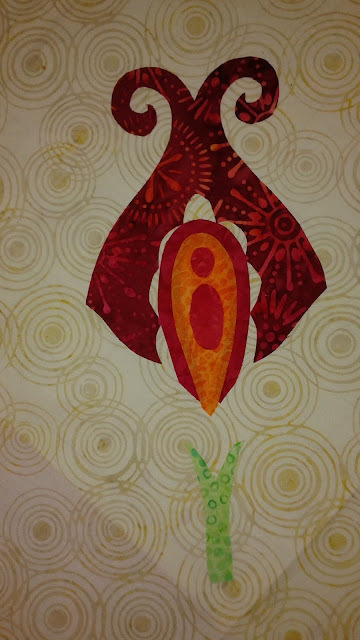 There are some of you who requested a video of how I quilt the patterns. I wanted to make sure I had pictures too, so I did my video on plain white fabric and took pictures while I worked on the actual quilt. 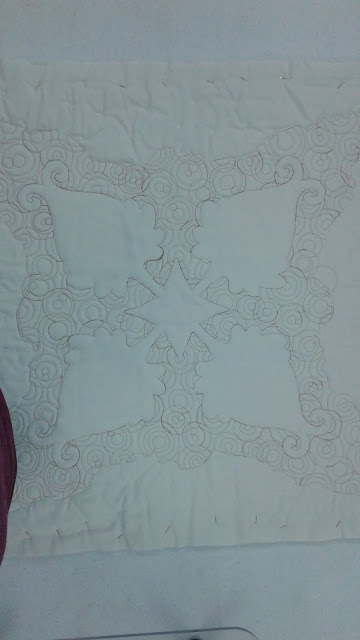 Here is the first video with me drawing and quilting the Lacy Clamshells. Blogger has a maximum size limit so we had to play with the video resolution some. I hope the quality is still okay. I'll keep working on it! Here is the second video with a different way to draw/stitch the design that is easier. I figured this out after I'd completed the first video. I hope they work! If not, no fears, there are directions to download here and pictures below. Just in case the videos don't work and for those of you who like pictures, here are the pictures I took as I worked on my quilt top. First, I made an arc. Next, I made about 1/2 circles back along the arc to where I started. No, they are not all the same size, but they are similar which is all that matters. If you only have a partial circle that's fine too. Then I traveled over and made a second arc and half circles (the lacy part). Here is the top row of completed Lacy Clamshells. Here you can see how I started the second row. I did 1/2 a Lacy clamshell and then a small one. Then I started the third arc. At this point I realized it would be way easier to quilt a bunch of arcs in a row and then go back and fill in the 1/2 circles. So that's what I did. It was much faster and way less backtracking which is always nice. I continued this idea and simply kept adding more Lacy Clamshells in a sort of diagonal row. Okay, but what do I do when I get to the edge? I did a little to make it look like the Lacy Clamshell went under the border. And here is the final brick! I really like this design. Especially once I figured out a way to make it easier! If you make all your arcs the same size your pattern will look more formal. If your arcs vary in size it will look more relaxed and modern. I love to see pictures of what you're working on and how your quilt is going! You can send them to me via my contact me page at the top of the blog or either of my Facebook Groups: Machine Applique Adventures and Free Motion Fun. Fingers crossed on the videos....it's my first attempt! New Traditions in Textiles: The Cathy Wiggins Award In this category, fiber artists are not limited to creating with traditional woven fabrics and are permitted to stretch the boundaries of what constitutes “fiber” and “textile”. Artists may use (but are not limited to) cheesecloth, vinyl, leather, paper, felted fibers, Mylar, Tyvek and many other materials that may behave like textiles in given circumstances. 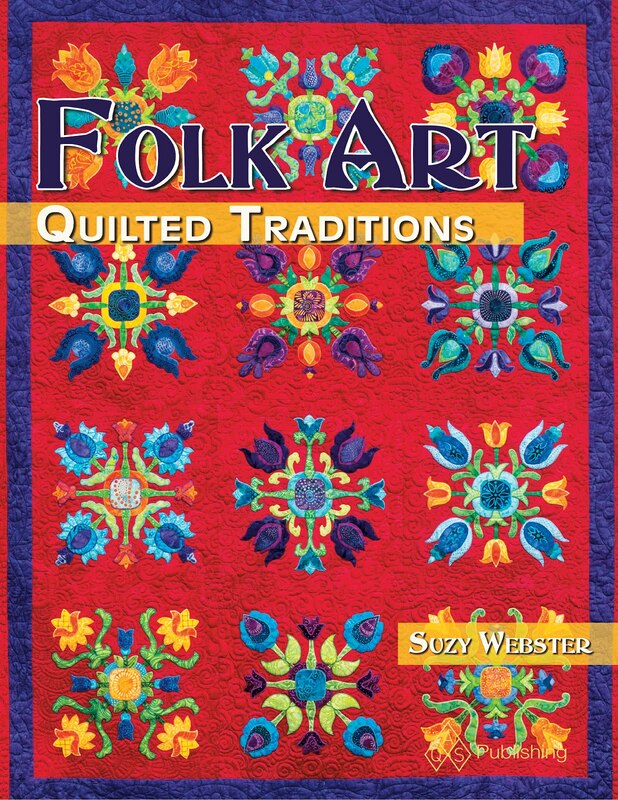 Unlike other categories, entries in this category may be framed or presented in non-traditional forms and need not fit the traditional definition of a quilt. All entries MUST contain machine quilting in some part of their construction. Minimum 72 perimeter inches and maximum 400 perimeter inches. Okay, so that sounds like a challenge. The vinyl jumped out to me when I read the details. So I headed to my local fabric store and came home with some wonderful shiny blue vinyl. My other inspiration was Tish in Wonderland's wonderful Zentangle quilt. I watched her pictures of it come in across Instagram (@websterquilt). Now that I had my fabric (Vinyl), needles (leather), and inspiration, I set to work. Since I couldn't figure out a way to mark the front of the fabric (it's slippery! 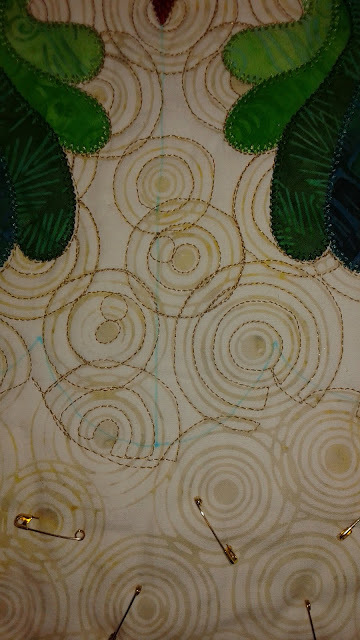 ), I marker the back of the quilt with interconnected circles. I then stitched on these circles and the circles appeared on the front. This was no easy task as the vinyl did not want to slide on the machine and in my infinite wisdom I'd done a test and decided that two layers of Hobbs wool batting would be the perfect choice. The sandwich was VERY thick. It was also a challenge to pin because every hole you have in the vinyl is there permanently. I pinned using regular straight pins from the back. I put them on the circle lines themselves so the holes would hide. I didn't use very many pins, but since I stitched out all the circles first the quilt was well basted. 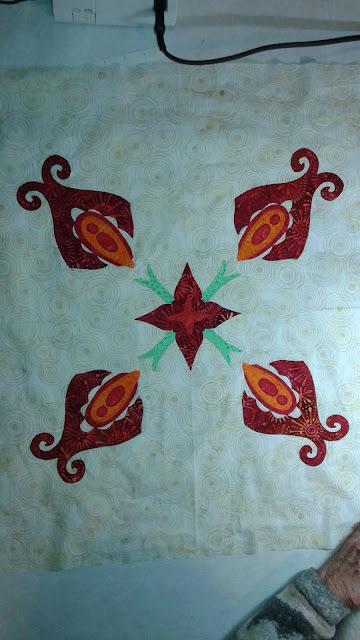 Then I was able to turn the quilt over and start playing with the circle designs. I'm happy to report that the green backing fabric I used slid easily over the machine bed. I decided that all the largest circles needed feathers and the background areas would be pebbles. Other than that I set no specific rules as I worked. I did try to use different kinds of fillers, straight lines and curves, next to each other so there would be contrast. When I got stuck my son would give me a suggestion like, "use triangles mom." I'm really happy with the overall results. I wanted to use something non-traditional for the binding as well. I chose a very light weight denim and it looks great against the edge of the quilt. Here are some closeups of the quilt. In the picture above there is a baseball quilted in. Once I'd stitched it I asked my son if he could find the baseball. He told me that should be the name of the quilt. I agreed. Off to MQX Springfield it will go in the fall! We went to an aquarium with family the other day and I was fascinated yet again by the jellyfish. Their floating tails scream feathers to me. I've seen a quilt done by Bethanne Namesh of jellyfish that is just fantastic. Someday I want to make one too. 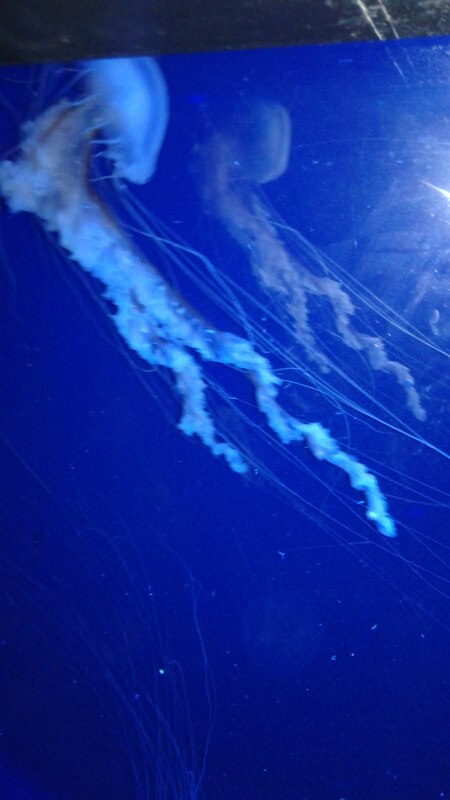 I love the top of this jellyfish too! Symmetry in nature. I love symmetry it always makes me happy. I love this little table topper I've been working on. It was fun choosing a gradation of greens to use for the leaves. One dilemma I had was how to quilt it. 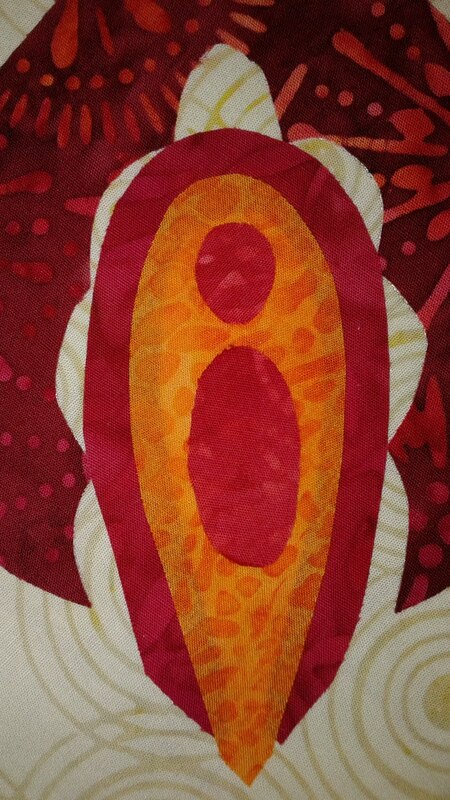 The background is a gorgeous swirly batik that I love, but the pattern makes it hard to quilt anything but swirls in it. You can see in the picture below that I decided to use a darker tan thread and simply quilt some of the lines of the circles. When I couldn't get to the middle of a circle I simply added and extra small circle to get there. This was a really fast and fun way to quilt. Below is the back of the quilt so far. You can see there is a big open area where the flowers are. I need to add some quilting there. And a last look at the center of the quilt. 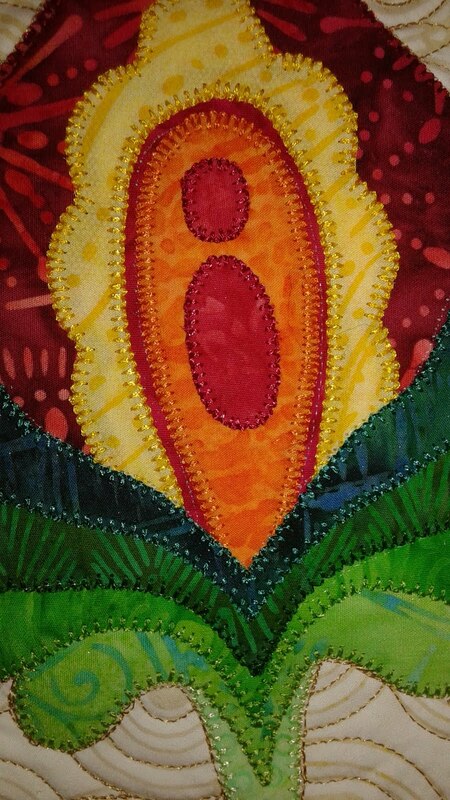 I am glad I used a darker thread for the quilting because I think it makes it really show up and I like that effect. If I am going to the effort I want to see what I did. It's time for the first filler on our Brick Wall Free Motion Quilt Along! If you need the directions for the pattern they are here. I will post video of this design as soon as I get a chance! I am so excited to get going on this quilt! I promise to bring some videos in soon. It's a learning curve for me. I've named this pattern Crying Clamshells because it consists of a tear drop surrounded by a clamshell. If you've seen it elsewhere let me know as I'm happy to give others credit. I came up with this pattern during my son's violin lesson. You should see his assignment notebook. It's full of doodle ideas! His teacher wonders about me sometimes and I do miss a few notes sometimes. But such is life. Let's get started. The first thing I did was put on my walking foot and sew around the perimeter of the square. I like to do this because it allows me to bounce off the edges or travel along them without a problem. It also helps stabilize the quilt. I chose to use a pink polyester thread (Glide by Fil-Tec, 40 weight poly) simply because it was already in my machine. I wanted to use a contrasting color so you could see the stitching. I start with a few tiny locking stitches and then switched to a 2.0 stitch length. 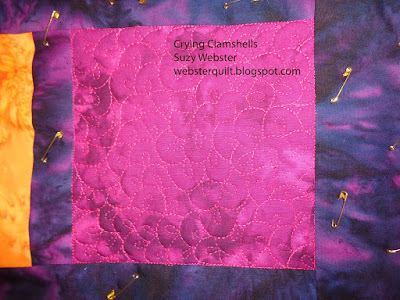 To start the Crying Clamshells I made a teardrop in the corner and then a clamshell around it. After reading through the post, before stitching on your machine, try drawing this design on paper. It really helps to get the feel of the pattern and how to move around the quilt. I then traveled along the stitching lines to make a second clamshell. Then a third clamshell. I start each clamshell at a point that's already been created in the design. If you look at the picture below, I would start the next clamshell by coming forward with my needle and starting in the corner in the middle of the picture. Sometimes I also have the problem of what do I do when I hit an edge? Here I made a half a clamshell. That's what I do when I hit an edge. I do the pattern a normal size and only quilt what I have space for. I find it looks more natural that way. Here is more progress as I work my way around. I try to fill in areas by moving around rather than in rows or columns. And I got a knot on the back. It happens to everyone! Look carefully at the picture below. See the space to the left of the needle? How am I going to fill that area when it's got two corners? I chose to fill the space as follows so it looks like part of the shell is simply underneath. That happens sometimes as I'm working. No one will ever notice unless they are staring at the quilt. Here I am stitching a simple teardrop to finish the pattern near the edge. If you look to the right of the needle you can see another partly finished clamshell. Such a yummy texture and a gorgeous Island Batik. Can you see the triangular shape in the picture below? It's in the middle towards the left. This happens sometimes when I don't get my path just right. Does it matter? Nope. It still looks good. I didn't even notice it until I was trying to figure out why I took this picture! Here you can see that I'm going toward the corner, but I've left an area to fill in. I decided to come back and fill it in right away. The area just to the right of my needle is very thin. Perhaps 1/4 of an inch. Oops. I should've tried not to do this. Did I want to rip it? No. So I simply made a really narrow clamshell. It works. If you look at the bottom picture can you even tell where all these "oops" moments are? No. I'm happy with the results. However, as I stated before, I highly recommend drawing the design out on paper before quilting it. It helps to learn the flow of the design. Here's a picture of my final square! I chose the upper right square to complete, but you can put this design in any brick you desire. I love to see pictures of what you're working on and how your quilt along is going! Send them to me via my contact me page at the top of the blog or join my new Facebook group for this quilt along Free Motion Fun. 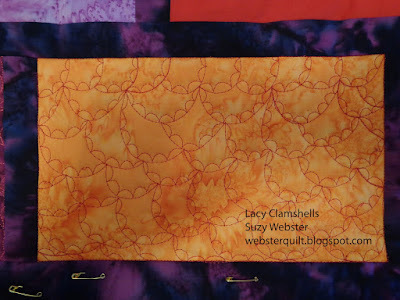 A blog viewer has asked me to share how I layer my quilts. I will get this posted sometime this week. I hope you get to quilt today! Come back next Friday for pattern number 2 in our quilt along! 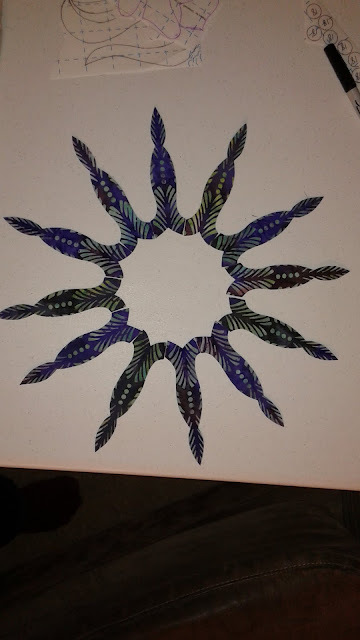 I've been working on a little applique project and am having a blast, but have encountered a shadowing problem. Shadowing is when the fabric underneath the top layer shows through and you can see a hint of color from below. So look at the picture above. See the large orange petal? Okay. Now, look closely at the edge of it closest to the red rim around it. See how the orange is darker in those spots? That's shadowing. Huh. Now the question is how to fix it. The first thing I decided to do was to layer a second piece of orange fabric over the problem. This helped a lot. If you look at the picture above you can still see a rim of red near the yellow. I decided that no one would notice this except for me. It's not a show quilt, so I'm okay with it. Here's another picture of the quilt in progress. Come back Friday to check out my Brick Wall Free Motion Quilt Along! And Saturday to see how I quilted this quilt. I am excited to be a part of the Christmas in July Blog Hop! Blog hops are so fun and it's a great source of inspiration. Thank you to Sarah Craig of Confessions of a Fabric Addict for organizing the hop. 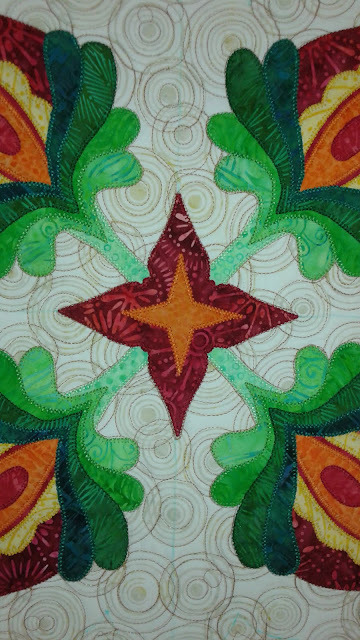 She's got a gorgeous Christmas Quilt Along going on during the hop so be sure to check it out! I decided I wanted to free motion quilt some stockings in colored thread. I drew a grid based pattern in my design notebook. Then I transferred the design to the fabric once a grid was drawn. Now it was time for the stitching. I realized as I was tracing the stocking shapes onto the fabric that two would need to go to the right (front of the stockings) and two would need to go to the left (back of the stockings). I used a bright green polyester Glide by Fil-Tec thread. I love the way Glide thread shines and it runs fantastically in my machine. The red fabric I chose for the top of this stocking had poinsettias, so why not? I love feathers. I'm not sure I've done one with this curvy of a spine before, but it looks awesome! I'll have to play more with this idea. This is a curl pattern that I believe is Angela Walter's. It's fun and a quick way to fill space. Next I sewed the stocking sides together at about 1/4 to 3/8 inch. To secure the stocking I then sewed a zigzag stitch in the seam allowance. You never know what might go in them and I didn't want a hole to happen! Then I flipped the stocking right-side out. To get it smooth I put my fingers inside the stocking and pressed out against the seams to even out the curves. Next it was time for the top of the stocking. The inner pieces had to be turned inside out and would become the hanging loops. The outer pieces are for the top flap of the stocking. I took the top flap and inserted it inside the stocking. The hanging sleeve is under there too. Pins were a necessity for this task. Next I flipped up the flap and then turned it over the stocking. It allowed me to have a finished look without having to bind the top of the stocking. Front of stockings! I really like the way the colored thread shows up on the white fabric. Back of stockings! I like these designs too even though they weren't for the front! You could stitch the back the same as the front, but I didn't want to spend as much time on the back as I did on the front so I went for something simpler. If you love to free motion quilt, check out my Brick Wall Free Motion Quilt Along that started last week here. Don't forget to check out all the other wonderful posts in the hop! Kaboom goes to Houston and gets Fixed too! It's the Start of Free Motion Fridays! 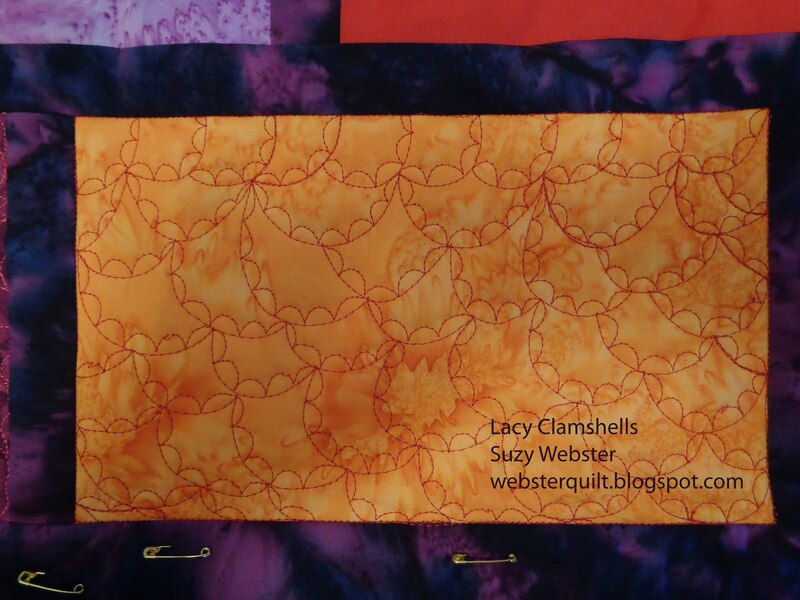 New Quilt Bloggers Blog Hop!